Welcome back. Having covered the time thieving monster of procrastination on my last post I’m happy to report that I’m now starting to get over it. It is an undoubted truism that it can be laid to rest by the mere act of sitting down and starting something, anything. So today I’ve had a bit of a scribble and come up with a new header for the blog, something which I hope says more about what goes on here than the last one, and the one before that etc. It’s been a lot of fun doing it as I managed to persuade myself that playing with my colour paints would be a very good thing today. The sun is shining and a bit of colour injected into what has been a very dreary few days lifts the mood. In the previous post I showed one of two sketches I’ve been playing with recently. Here is the second of the pair. 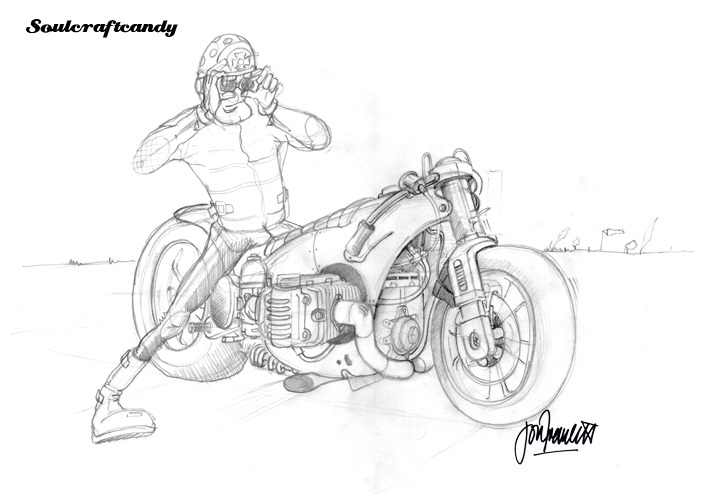 It follows along the lines of the theme for the first one and continues with the idea of a frame which is more of a monocoque forming the bodywork of the bike as much as the support for the engine and chassis parts. Again it’s also fun to experiment with some kind of extreme engineered front end, I’m developing a soft spot for these single legged kind of forks, and have another great big engine slung in there to create a fun feeling of speed and power. I was trying to work out where the inspiration for these two drawings came from. It’s interesting that often I’ll draw something and have no recollection of where the idea might have come from. I gather images of all kinds of stuff from books, the internet and photographs I take myself. In an attempt to be well organised I file them away on a hard drive somewhere and try to catalogue them so that I can refer to them later. But what often happens is that I rarely look at them at all whilst I’m drawing. As a consequence I often generate an initial sketch without their help but, some part of them must lodge itself in my mind somewhere as I can often find a link between a drawing and a stored image after the event. It’s a strange twist on post-rationalisation I suppose. 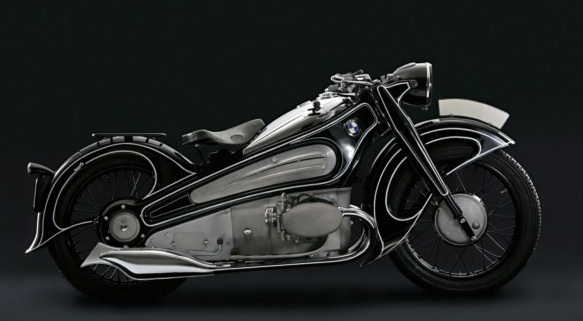 The BMW R7 shown in the picture is where the main inspiration for these two drawings came from. It’s from the 1930’s as far as I know. I love it. It’s such a fantastic expression of futuristic thinking from that period. There is so much motion in the form language, extenuated by the white pin striping but it is the way that it appears to have no frame that catches my eye first. I’ve got a feeling this bike will influence a few more of my doodles before the effect wears off. Anyway, this sketch above will get worked up along with the other one in ink to start with. I love it as it is in pencil so I’ll most likely work through onto another sheet with the light box and then revisit this image with more pencil work to get some more detail in there and some deeper tonal areas. I’d like to then scan the inked drawing and print a few out so that I can start to play around with some colour without risking mucking up the original, I’d hate to lose a good drawing through messing about with some paints. I’ll keep you posted on how it goes. This entry was posted in Colour, Drawing, Expressions, Workbnench by Soulcraftcandyman. Bookmark the permalink.